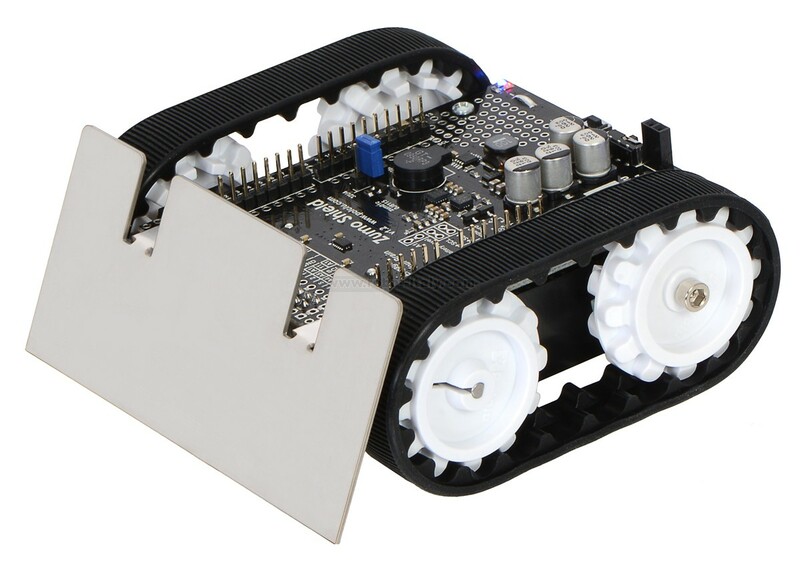 The Pololu Zumo robot is an Arduino-controllable tracked robot platform that is less than 10 cm × 10 cm—small enough to qualify for Mini Sumo. The Pololu Zumo robot is an Arduino-controllable tracked robot platform that is less than 10 cm × 10 cm—small enough to qualify for Mini Sumo. It includes two micro metal gearmotors coupled to a pair of silicone tracks, a stainless steel bulldozer-style blade, an array of six infrared reflectance sensors for line following or edge detection, a buzzer for simple sounds and music, a 3-axis accelerometer, magnetometer, and gyro for detecting impacts and tracking orientation. Just add 4 AA batteries and an Arduino (or compatible controller) and you are ready to push! No soldering or assembly is required. 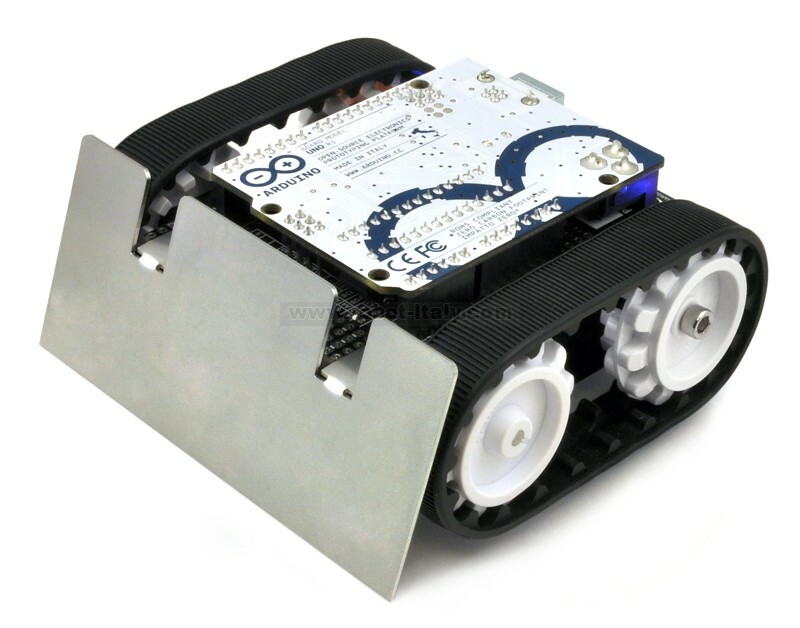 The Zumo robot is a low-profile tracked robot platform intended for use with an Arduino (or compatible device) as its main controller. It measures less than 10 cm on each side and weighs approximately 300 g with an Arduino Uno and batteries (165 g without, as shipped), so it is both small enough and light enough to qualify for Mini-Sumo competitions. It uses two 75:1 HP micro metal gearmotors to drive the treads, providing plenty of torque and a top speed of approximately 2 feet per second (60 cm/s), which makes it much more agile than competing robots like the Solarbotics Sumovore and Parallax SumoBotwhile still offering plenty of control. The Zumo robot includes a 0.036"-thick laser-cut stainless steel sumo blade mounted to the front of the chassis for pushing around objects like other robots, and a reflectance sensor arraymounted along the front edge of the Zumo (behind the sumo blade) allows the Zumo to detect features on the ground in front of it, such as lines for following or edges for avoiding. 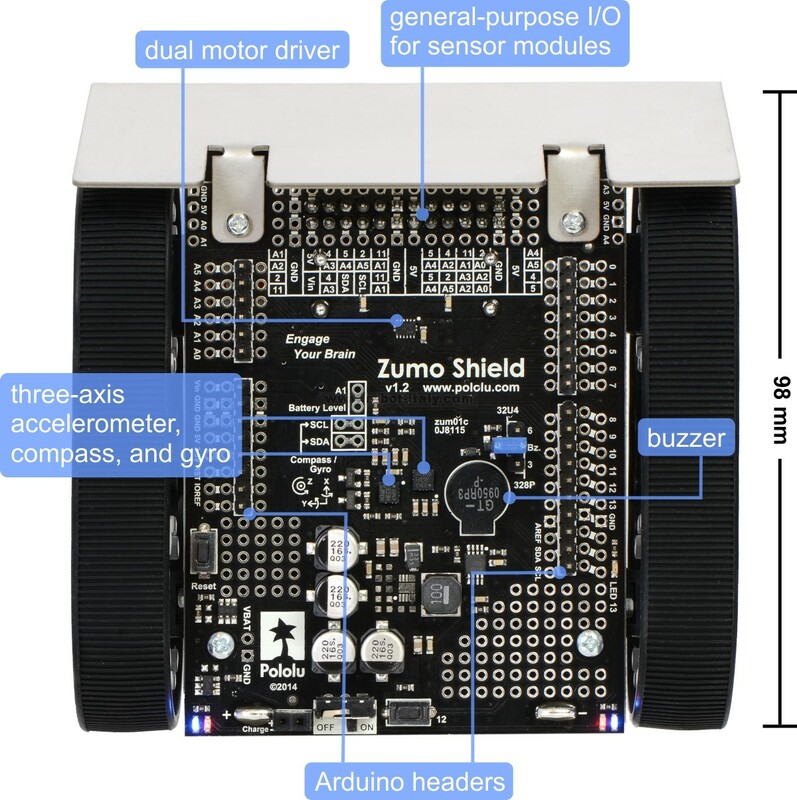 The Zumo control board is essentially a shield for the Arduino Uno or Leonardo, both of which can be plugged directly into the shield’s male header pins, face down. (It is not compatible with the Arduino Mega or Due, but it can be used with older Arduinos that have the same form factor as the Uno, such as the Duemilanove.) The shield includes dual motor drivers, a buzzer for playing simple sounds and music, a user pushbutton, and a 3-axis accelerometer, compass, and gyroscope for sensing impacts and tracking orientation. It also boosts the battery voltage to power the Arduino and breaks out the Arduino I/O lines, reset button, and user LED for convenient access and to accommodate additional sensors. The only difference between this and the previous Zumo Robot version is the use of a v1.2 Zumo shield in place of the previous shield version. This newer control board has a newer accelerometer/magnetometer module and adds a 3-axis gyroscope, but it is otherwise identical to the previous shield. 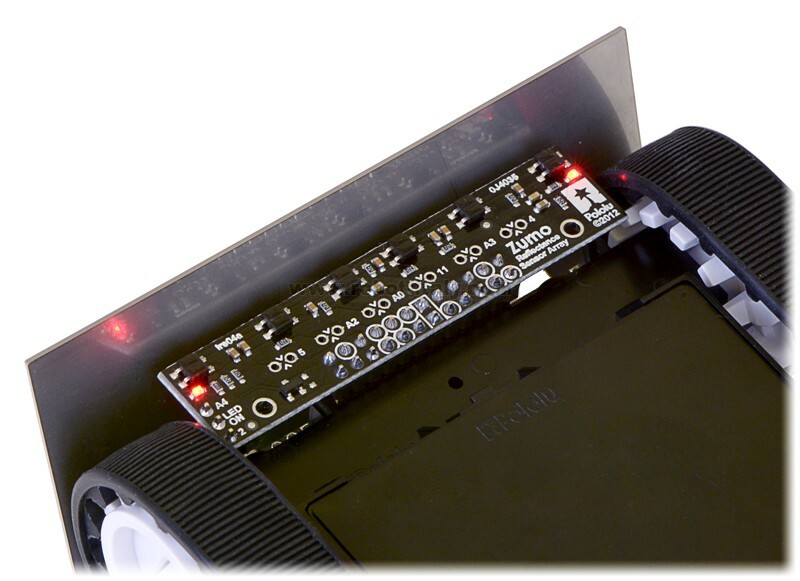 The robot ships as shown in the main product picture; no assembly or soldering is required. An appropriate Arduino(or compatible controller) and four AA batteries are required but not included. Integrated LSM303D 3-axis accelerometer and 3-axis magnetometer that can be used to detect impacts. The compass gets a lot of interference from the motors, batteries, PCB, and its surroundings, so it is not generally useful for precision navigation, but we have found that with proper calibration, it can be used for rough orientation measuring in many environments. This part is an upgrade over the LSM303DLHCaccelerometer/magnetometer IC included on previous versions of the Zumo shield for Arduino.